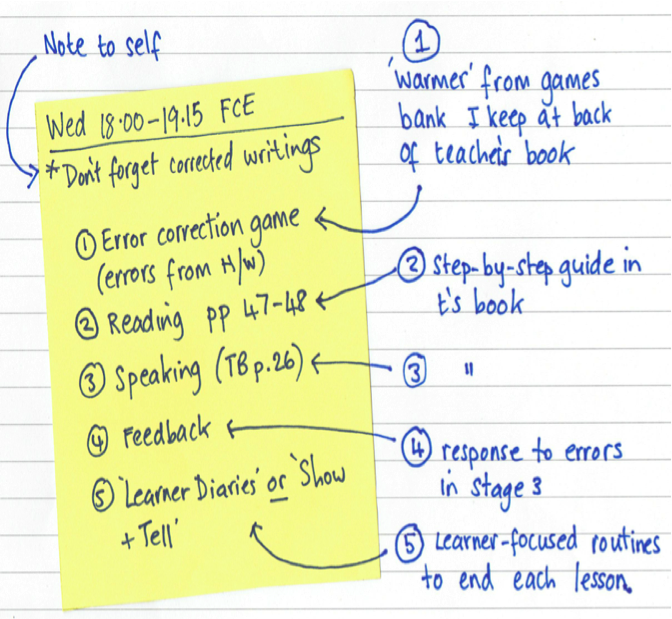 Writing a lesson plan before a class is a bit like writing a list before packing for a trip. You can travel without a list of course but you will avoid a few problems if you spend a bit of time planning – not a whole week though. That would be silly. A few minutes should be enough. Pre-empting problems will bring peace of mind and when it comes to teaching, this is a major defence against burnout and work stress. You can find lesson plan templates on the Internet too – that you can fill out yourself for your own classes. Here’s a typical one in a word document that you can change to suit your needs. More experienced teachers tend to spend less time on lesson planning. They know what they have to do in the lesson. And if they ever get it wrong, it doesn’t matter because they are armed for most eventualities and have a mental library of Plan Bs. But what the wise teachers have in common - whether they are new or more experienced - is that they understand the importance of lesson planning but are 100% practical in their approach. A 45-minute lesson should warrant around 5 to 10 minutes planning time. And the plan should be simple and always follow the same format so that it becomes second nature and end up almost writing itself. I’ve managed to reduce my prep time by around 90% since I started teaching - granted that’s quite a long period of time - but there really is no need to be a slave to lesson planning. Save your energy for the classroom - that’s where you’ll need it most. Gather everything you need (course book, teacher’s book, class register, timetable, etc.) and make a cup of tea. Look at the pages in the course book that you are going to be using. Then look at the corresponding teacher’s book pages. This is where you’ll find ideas for warmers and coolers, extra activities, tips and ideas, photocopiable worksheets … you don’t need to re-invent the wheel. An experienced materials writer has done the job for YOU. Where did we get up to in the book? Is there any marking to do? Finally, here’s an example of one of my lesson plans – and YES! I write my lesson plans on a post-it. If the plan doesn’t fit, then I’m being over ambitious, I’ll fail and feel bad. Katherine, I wish I could do that! I've been a teacher for more than ten years, and still struggle and spend a long time planning. I keep some files in my computer with all the activities I have used, so that I can repeat some of them the next time I teach the same level, and that helps a lot, but, still, I agree that maybe I am being over ambitious. Thank you for sharing! The first thing, in my humble opinion, for a plan to work is to think where we are going, that is, the objectives; and then how to know if we have arrived there. A set or list of activities might be seen as a plan, but it is not if the activities (however fun and "good") do not point at achieving something. Yes, I agree that it can be easy with a coursebook, especially a good one. But two years ago I started working for a private school that uses no resources - we teachers have to provide our own materials. That means that a lot of extra work has to be done, and the old-school lesson planning is much harder to avoid. Any ideas on how to quickly and effectively prepare teaching materials - and ones that do not violate the copyright? I'm looking forward to a post addressing this subject. I don't really agree with this. I appreciate the notion of cutting down planning and I can spend as little as 10 minutes on a plan. However, simply following what's in the coursebook is not necessarily conducive to a good lesson, as it means your linguistic and communicative lesson aim is nothing more than: to complete two pages of the book. I agree with the point that efficiency can only be achieved by being prepared and having a plan. This is true for both spoken an written english. in terms of speaking, the best method is speaking with people who are more fluent than you, without worrying too much on grammar. Challenge is there aren't a lot of English teaching programs that do this, other than a few like Spoken English Practice. www.spokenenglishpractice.com. So you pursue the same inefficient methods you have been trying all your life like memorizing grammar rules. I hope more and more ESL teachers read posts like this and improve their methods of teaching. Teaching English needs to be modernized! Fielder, C., “Are detailed objectives really necessary in lesson planning?”, The Teacher Trainer Journal, Vol 28/2, May 2014, pp. 18-20. Katherine, thank you for the article. A nice example for a busy teacher. Could you share your 'error correction game'? The school I work for wants to implement a "flipped" learning approach, and we don't really "follow" a particular group of students (they are all adults), but I think putting all the material (teacher's book, lesson (from the students' perspective), powerpoint, other material) on my table helps me see how to make links with all of them and what I would choose to change (sequence or activity). I also plan transitions between different parts of the lessons (questions to ask my students that can help me go from one place to the other). A useful lesson plan sample!